Triumph started out in Germany in 1886, as a small-scale venture, manufacturing corsets in a barn with six sewing machines, and has today emerged as an Iconic Global leader in Innovative and Sensational Lingerie, with presence in over 120 countries. Triumph came to Pakistan in 1971 to manufacture undergarments for export as well as for the local market under the Triumph brand. However in 2001, it was decided to sell the locally manufactured undergarments under the IFG label and re-launch Triumph as a fully imported brand of lingerie. Today the entire Triumph range is available in Pakistan is imported and available through 140 retailers in the country, across 10 cities including Triumph and Intimate Fashion Stores in Karachi and Islamabad. Advertising or spreading awareness about intimate wear publicly in Pakistan is still considered bad, let alone talking about it is considered soundly. 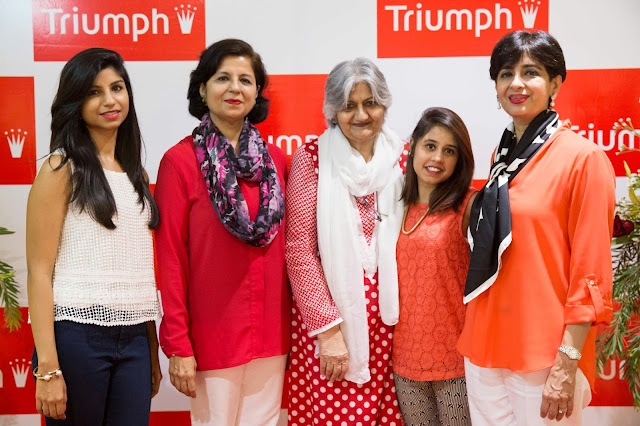 Triumph has no means of advertising and spreading awareness for the women of Pakistan, which is why they arranged a meet up to spread the word through writing, from the history to the collection. The meet up at their flagship store in Dolmen Mall, Clifton followed by lunch at Noodle House was for selected journalists and bloggers in Karachi. Even I was amazed to know a lot of things that I didn't about Triumph and the collection at the meetup. All I knew till now was cups from A to Double D. To my surprise, they have cups from A-H and sizes 30-46. The problem is that the sales girls are not properly trained or educated about the collection, or about the bras and body types. Which is why some of them lacks in helping the ladies out when they look for something, and to guide them properly. Triumph has a wide range of bras to cater every Pakistani women for every occasion. The range includes Fashion Bras in lace, T-shirt Bras, Strapless and Backless bras, Balcony, Classics, Cotton Bras, Minimizers and Maximizers, Body Shapers , Training Bras for Beginners, Sports Bras, Nursing Bras - in wired and non-wired, padded, non-padded and seamless styles in variety of colors. Now, did you know they had such a huge variety? I didn't! I bought one, and I must say I am very pleased with the quality and the fitting. Do check, and share the feedback.